Brandy Baker / The Detroit News Peggy Kalis, back center, and Steve Brown pour a bag of soy meal into a tub as volunteers prepare food for hungry people in the Darfur region of Africa and Metro Detroit. Kalis is one of the organizers of WISDOM, Women’s Interfaith Solutions for Dialogue and Outreach in Metro Detroit. Jena Raslan, right, who is Muslim, and Arielle Hines, a Christian, pack up a box of meals as Kareem Raslan helps. WISDOM packed 8,000 meals Sunday morning. As politicians and religious leaders stumble in the face of conflicts in the world, four women say, God brought them together. First, last spring, Peggy, who is a Christian, met Gail, who is Jewish. Then, the two of them met Shahina, who is a Muslim. The three then met Trish, who is a Catholic. The four women say they quickly realized that their dedication to their faiths made them more similar than different. As they found one another at activities in churches, synagogues and mosques in Metro Detroit, they also realized that in addition to praying to the same God, they had been thinking the same thought: How do we bring women of diverse faiths together to benefit the community and to learn about different religions? 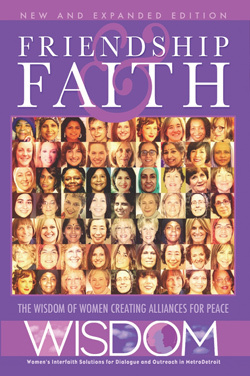 They united to establish WISDOM — Women’s Interfaith Solutions for Dialogue and Outreach in Metro Detroit. It is just one initiative to unite the local followers of diverse religions. “We wanted to do something to foster peace and also do some services for the community,” said Shahina Begg, who attends the Unity Center of Bloomfield Hills, a mosque. Chats through the summer over coffee led to lunches. Lunches led to organizing events. On Sunday, the group — now, with the name and some 100 members — gathered in a donated trucking warehouse in Wayne. About 250 women and children, including Jews, Catholics, other Christians, Muslims and Hindus, used the $4,000 WISDOM collected to purchase meals of rice, soy meal, chicken and vegetables. They packed the meals and sent them to Darfur, the region of western Africa where hundreds of thousands have died and millions have been displaced in a brutal years-long conflict. Some of the meals also will benefit local shelters and kitchens for the homeless and hungry in Metro Detroit. By participating in the food drive, the women of WISDOM say they are learning about one another’s faiths in ways that allow them to dispel ignorance and fear. It is an endeavor to which all Christians, Jews and Muslims are obliged by their faiths — to serve and respect others, especially strangers. “Maybe women can make a difference where men can’t,” said Gail Katz of West Bloomfield, who is a member of Congregation Beth Shalom in Oak Park and a vice president of the Jewish Community Council, an umbrella group of many Jewish organizations in Metro Detroit. “This just seemed like a fresh approach,” Katz said. Other local groups are making efforts to unite Muslims and Jews, specifically. The American Jewish Committee is sponsoring a conference Thursday at the Adat Shalom Synagogue in Farmington Hills, where local Muslim leaders will answer questions. Peggy Kalis, who helped organize WISDOM, says the women’s group is already planning another event in March in which women from Begg’s mosque and from Katz’s synagogue will gather for lunch and discuss Islam and issues of concern. “It is just so very important to break down the walls and to get to the point that we all recognize that we are all human beings, we all feel the same things, and we want the same things for our families and our friends,” said Kalis, who attends the Church of Today West in Farmington Hills. The fourth founder of WISDOM, Trish Harris, who attends St. Hugo of the Hills in Bloomfield Hills, said Sunday that the volunteers organized by WISDOM packed 8,000 meals in the morning and expected to pack 10,000 in the afternoon. “We had a lot of kids here today, and I think we started a tradition of them getting outside of themselves, doing things for someone else and enjoying the other children who were here,” Harris said.